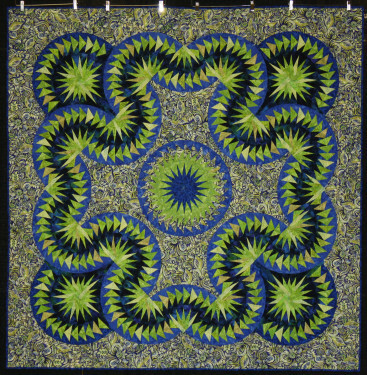 ounded in 1983, Boise Basin Quilters Guild (BBQ) is the largest quilt guild in Idaho. Members live in Boise, the capital city of Idaho, and in neighboring towns and communities. There are no geographical boundaries for membership. Members come from Mountain Home in the east to Weiser in the west, from Owyhee County in the south, and the McCall area in the north. Our goal is to promote quilting and provide a place for quilters to meet and network. General meetings are held the 3rd Thursday of the month at the Boise Church of Christ, 2000 North Eldorado Street. The church is one block east of the corner of Cole and Fairview, then two blocks north on Eldorado Street. Meetings start at 7:00 pm. The fellowship hall is open at 6:30 so that members and guests have time to visit all the activity tables which includes our huge library. We do not meet in December or July to give our members a break at these busy times. See the Events page for scheduled events.